Nate Carlson has been a gamer since the early ’90s and some of his favorite genres include third-person shooters and RPGs. He has cerebral palsy and as such can only navigate those genres with one hand, which he prefers. The world and storyline of L.A. Noire is big and complex, but don’t let the grandeur of the game scare you – you will be missing out on a lot. The graphics are some of the best to date. The game is set in 1947 and you play Cole Phelps, a returning World War II veteran who is now a beat cop. Slowly but surely you work your way up the division, changing roles and status within the police department. While doing this, you uncover a string of crimes that tie into Cole’s experiences in the war. It is into this world of crime and intrigue I arrive. I approach playing a game like this in a pretty unique way. First, I set the controller flat on my lap. Then I position my left hand on the controller. Depending on the game, I position my hand differently on the controller – if I need to move a character without shooting or using a lot of other buttons, I simply grip the left analog stick with my fingers and move it. If I need to use the other buttons while moving, I move the analog stick with my palm while pressing the other buttons with my free fingers. Mostly I can reach all of the buttons with my fingers while using the analog stick in this way. 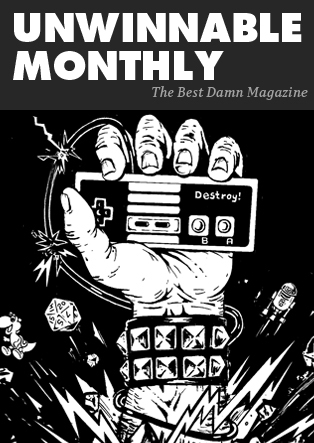 However, when I’m in the heat of the moment, playing furiously, I often have to reposition the controller because I inadvertently move it while playing. That may seem frustrating to you, but to me, rising to the challenge of playing a game in this way is half the fun! The game’s controls are straightforward. Playing games one-handed is dependent on the schematics and the layout of the controls as well as the design of the game – these requirements often pose a problem for a fan of the action adventure genre. Fortunately, L.A. Noire does a great job of staying accessible. As with most of Rockstar’s games since Grand Theft Auto 3, the same basic controls are used for several different gameplay elements – running, fighting and driving may all be very different in the real world, but in games they all come down to the same couple of buttons. 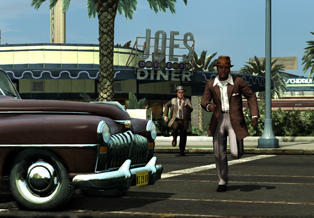 In L.A. Noire, it’s much the same. Whether you are running down a suspect on foot or tailing them in a car, you are using the triggers to control the accelerator and the brake. When the guns come out, the left trigger aims and automatically sticks the sight to your target while the right trigger fires the gun. Things get switched up for fisticuffs – you will need to put one finger over the left trigger (to lock on to your opponent) and thumb over the A or X button to block or punch respectively. Managing all those buttons may seem hard with one hand, but here’s how I do it: I use my little finger to press the left trigger, my index finger to press the right trigger and my thumb to press any of the face buttons. Finally, I use my palm to control both analog sticks (though not at the same time). L.A. Noire is a game that someone with physical limitations in either one hand or both can enjoy to the fullest extent. With one hand, it seemed daunting at first, but I quickly overcame that with determination, as well as wonder and fascination for the game. Rockstar should be praised for making a game so groundbreaking and, if not consciously, widely accessible for a diverse spectrum of people. From all of us one-handed gamers, we salute and say thank you. Keep plugging out more games like these. Hey Guys! Look at that Poster!